To address the patient eligibility issue, CTTI has advocated that study sponsors evaluate study design and protocol development, feasibility and site selection, and recruitment communication planning as levers to increase eligibility. However, better study planning and communication can only go so far. As the primary indication in clinical trials becomes more targeted (e.g., genetic markers, resistance to first-line therapy, rare diseases), the need for assistance in recruiting and retaining eligible patients grows. While there are a number of tools available to supplement patient recruitment, none of these approaches will be successful without the buy-in and support from the site’s staff. In this column, we present the “voice of the investigator” through the summary of results from a global investigator survey related to current practice and associated value of various patient recruitment and engagement approaches. DrugDev surveyed 466 clinical trial investigators from its Global Network in 14 countries: Argentina, Australia, Brazil, Canada, China, Czech Republic, Japan, Mexico, Poland, South Africa, South Korea, Spain, Taiwan, and the U.S. An invitation to participate in the 21-question online survey was e-mailed to approximately 24,000 randomly selected investigators. The survey was open from July 3 to August 4, 2017. Respondents were offered the chance to win one of five $500 Amazon gift cards, or to have a $500 donation to the Red Cross made on their behalf. Among other topics, respondents answered a series of questions related to their patient recruitment and engagement activities. 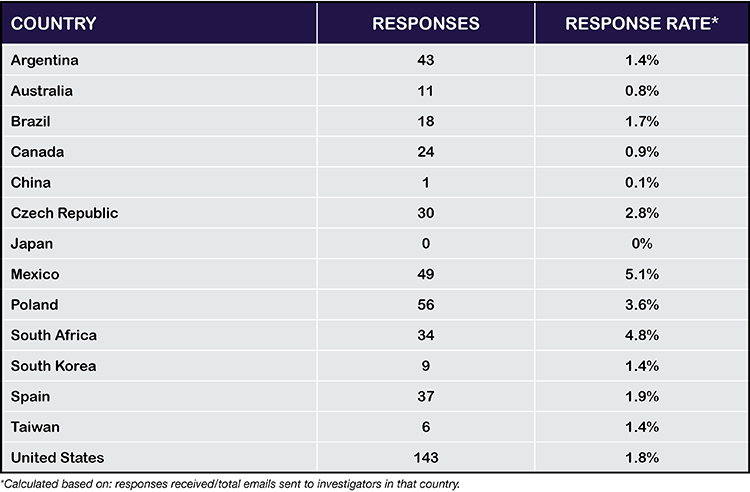 In total, the global analysis included 466 investigator responses from 13 of the 14 countries surveyed (no responses were received from Japan) (see Figure 1). The overall survey completion rate was 2.2%, and country-level analysis was done for seven countries that reached their target sample size: Argentina, Czech Republic, Mexico, Poland, South Africa, Spain, and the U.S. Approximately 82% of respondents reported that they had conducted more than five studies in the past five years (57% had conducted more than 10 trials in this time period). Most investigators reported having experience in more than one therapy area (an average of 4.3 per investigator), with clinical research (36%), cardiology (33%), and endocrinology (31%) receiving the most mentions. Slightly more than half of respondents work solely on industry-sponsored studies. Respondents came from a mix of practice settings, with 37% based in a hospital or medical center, 31% in a mixed research and non-research clinical practice, 26% in a dedicated non-hospital research site, and 6% in other types of settings. As shown in Figure 2, most sites complete their own recruitment activities (78% always/very often); this did not vary significantly by the type of site or by country. Sixty-five percent of sites used their own electronic medical record/electronic health record (EMR/EHR) system to identify potential patient candidates, whilst far fewer sites reported working with a third-party EMR/EHR to identify potential patient candidates (24% use these always/very often, and 27% of sites never do). While half of sites will accept referrals from another physician (54% always/very often), they were less likely to accept referrals from a central recruitment campaign (38% always/very often). To assess accessibility of clinical trials, we also asked sites about their visiting hours (see Figure 3). Nearly 70% of sites provide early-morning clinic hours, whilst provision of evening and weekend hours were less common (35% and 20% always/very often, respectively). As shown in Figure 4, nearly 70% of sites reimburse patients for their travel costs, and 61% send visit reminders to help keep patients engaged in the clinical trial. Less than 10% never provide these engagement activities (3% never reimburse for travel costs and 8% never send visit reminders). Patient stipends to compensate for the time spent in a clinical trial were slightly less common, with about half of sites always/very often providing a patient stipend. Figure 5 considers country-level variations in the survey results. 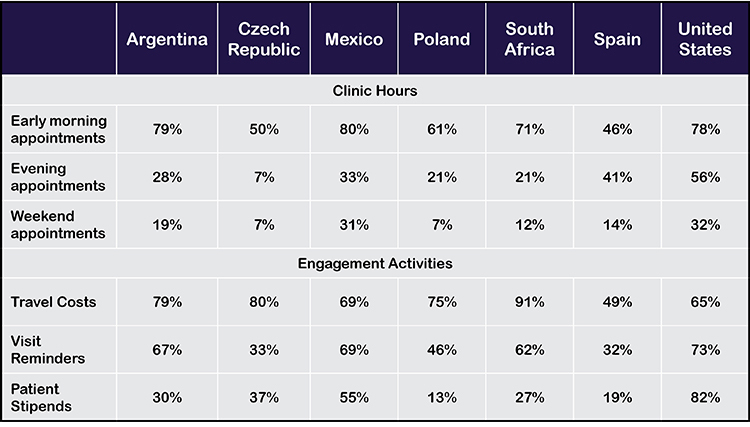 In terms of variations in the provision of extended clinic hours across different countries, respondents from the U.S. reported results that were amongst the highest level of early-morning, evening, and weekend hours for clinical research. The prevalence of early-morning hours at sites was similar (and slightly higher than the 78% reported in the U.S.) in Argentina and Mexico (79% and 80%, respectively). Spain had the lowest percentages of early-morning clinic hours, but had the second highest provision of evening clinic hours, perhaps reflecting the cultural norms in Spain. Provision of extended hours for clinical research was least common in the Czech Republic, with only 7% of sites providing evening and weekend clinic hours. As for the use of patient engagement tools in different countries, there was some variation in the provision of reimbursement of travel costs, visit reminders, and patient stipends. South Africa sites were the most likely to reimburse patients for travel costs (91% always/very often) and sites in Spain were least likely to cover travel expenses (49% always/very often). Spanish sites were also least likely to send visit reminders (32% always/very often), whilst those in the U.S. were the mostly likely to send these (73% always/very often). Provision of patient stipends varied more widely across countries, ranging from a low of 13% for sites in Poland to a high of 82% for those in the U.S.
Globally, most sites complete their own recruitment activities, typically using their own EMR/EHR. Tools provided by sponsors and contract research organizations (CROs) to supplement recruitment, such as a central recruitment campaign or referrals from third-party EMR/EHR systems, were used less frequently. Lack of use by sites suggests that sponsor and CRO investment in this area is not providing a maximum rate of return. A recent Society of Clinical Research Sites white paper sheds light on the topic by suggesting that current site practices will need to change in order to increase the use of patient recruitment agencies.4 This paper also notes that reimbursing sites for the time it takes site staff to process externally generated referrals and engage with the recruitment agency will be an important factor. While the results of DrugDev’s survey revealed that many sites provide early morning clinic hours, it is unclear why more research sites do not offer evening and weekend hours. More research is needed to investigate whether this is due to preferences in the patient population, or the economics of staffing the office outside traditional business hours. Beyond the convenience of clinic hours, strategies such as appointment reminders and travel reimbursement can make a real difference to the motivation of patients to participate and ultimately remain in a study. As such, it was not surprising to see a large number of sites providing travel reimbursement. Although sites indicated that they valued providing a patient stipend, the proportion of sites offering compensation for patients’ time was lower. Whether this is due to real regulatory restrictions, or merely the perception of barriers, participation in a clinical trial directly impacts wages earned or annual leave/sick time accumulated by employees who have to take time off work for study-related visits, and as such should be seriously considered by sponsors and CROs. Although included in a different section of the survey, we also investigated the use of e-consent, which has been shown to result in better understanding of the purpose and process of the trial, which in turn correlates with greater patient retention. In the 2017 survey, we found that only 38% of respondents have used e-consent in any of their trials over the past year. Whilst this represents an increase in use when compared to the 2016 survey (28% use in any trial6), there is still a long way to go to achieve widespread adoption of this patient engagement tool. Similar to the comment above, our experience is that perceived barriers, rather than real regulatory restrictions, limit the use of e-consent globally. One additional factor that should also be considered in the evaluation of patient recruitment and retention tools is the type of trial site, as this also may inform our “one size does not fit all” conclusion. An early look at our data suggests that there may be differences in use of recruitment and retention tools across different types of sites at the country level, however, the sample size was not large enough for a more detailed analysis. This is an area that we believe requires further research, particularly given the country-based variability in distribution of types of clinical trial sites. What is clear is that, with the continued rise in protocol complexity, challenges related to subject recruitment and engagement will not go away. Further, when the variations in preferences by geography and type of site are considered, it is unlikely that these recruitment and engagement challenges will be solved simply through better study planning at the global program level. With our results demonstrating that addressing recruitment and engagement issues is not a “one size fits all” situation, sponsors and CROs wanting to avoid delays in patient enrollment timelines will need to engage directly with sites to determine the most efficient mix of desired support, both in terms of tools and (where possible) budget support. Getz K. 2014. Characterizing the global investigative site landscape. Presentation at the Drug Information Association 50th Annual Meeting. Elisa Cascade, MBA, (elisa.cascade@drugdev.com) is Chief Product Officer for DrugDev. Claire Sears, DPhil, (claire.sears@drugdev.com) is Director of Product Communications for DrugDev.